A ball game at AT&T Ballpark raises not only parking garage/lot prices near the ballpark, but also metered parking prices. Depending on the location of the metered parking spot, the metered spot can cost between $5 and $7 per hour. Therefore, a metered spot would cost $15 to $21 for three hours, a typical length of a ball game. Many of the meters near the ballpark have a four hour limit or no limit. Higher prices is not the only problem. If your destination is not AT&T Ballpark but happens to be near it on a game day, you would want to know that parking prices will be higher and parking will be more difficult to find. You may want to take public transportation instead if you don't want to deal with difficult parking on game day. 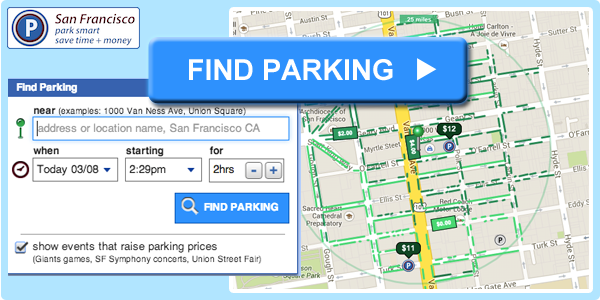 You can check the page "Events That Raise Parking Prices" to see if there will be a ball game that will raise parking prices. 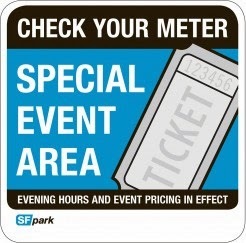 ParkinSF.com shows you higher prices on meters on ball game days so that you can expect to pay more on game days.